Like a steak, the ideal grilled salmon has a seared crust and a crispy skin and yet is still medium-rare inside. This method works best with king salmon but you can safely use it with any kind: sockeye, silver, pink, even famed Atlantic salmon. Serve your grilled salmon with a tangy sauce, such as chimichurri. Cut salmon into serving pieces. Salt the salmon lightly and set it out at room temperature for 15 to 20 minutes before cooking. Fire up the grill. Make sure the surface is clean. Get some vegetable oil ready to wipe on the grill later. After 15 to 20 minutes of setting out, pat the salmon dry and then use a butter knife to scrape the skin side to get any moisture or scales off. This makes the skin side drier so it will not stick to the grill. Coat the salmon with oil. When the fire is good and hot, wipe down the grate with a paper towel that has been dipped in the oil. Put the salmon on the grill skin side up. It seems counter-intuitive, but do it anyway because you want a good sear on the fish, and you cannot do this well if you start skin-side down; the fish will cook too much and will fall apart when you try to flip it. The uncooked skin helps hold things together. 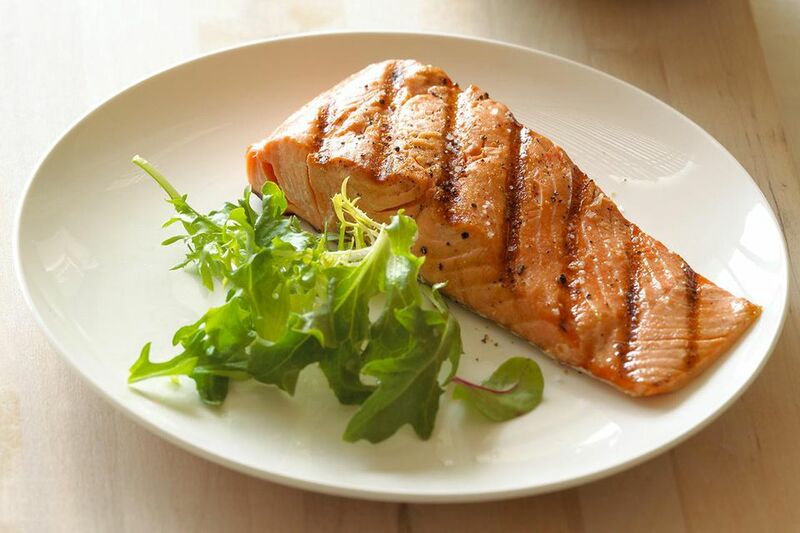 Leave the salmon on the grill for a solid 4 to 6 minutes, depending on thickness. A thin sockeye fillet might need closer to 3 minutes on one side. You will know it is ready when you can slide a spatula underneath the salmon. It might stick in one or two spots, but it should be mostly crusted over. Gently flip the salmon onto the skin side and leave it again for at least 3 minutes, a bit longer if it is on the thick side. Exactly how long depends on thickness, but it'll never be less than 2 minutes on high heat. Watch the fish, and if the flakes begin to separate, you're done. Take the salmon off the heat, sprinkle lemon juice on it, then let it rest for 2 to 3 minutes. Serve with your favorite sauce.